The exhibition COLORS OF DESCENTS presents three positions in painting, that share influences from the visual structures of early 1990s computer-game graphics. The exhibition COLORS OF DESCENTS presents three positions in painting, that share influences from the visual structures of early 1990s computer-game graphics. 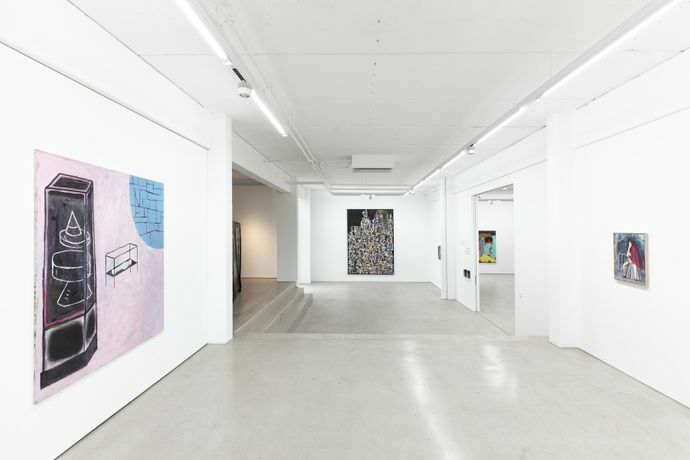 The artists Tobias Hild, Julius Hofmann and Robert Seidel are graduates of the Academy of Visual Arts Leipzig and their work is presented together for the first time at G2 Kunsthalle. Using different strategies of appropriation they draw on a repertoire of video-game scenarios, a field whose relevance to the development of visual art has yet only been marginally acknowledged. The title COLORS OF DESCENTS refers to the fact that the work of all three artists shares reminiscences and relations to deeply essential, lasting memories and experiences of »hidden« worlds. The »depths« (into which their descents plunge) stand for the dark, unknown spheres beyond the realities of our lives, a world into which the first generation of digital games dragged you via the black background of the screen. The exhibition explores the question of how painterly approaches, rooted in a narrative tradition, can reflect phenomena of collective (youth culture) memory. The speed of digital media – in particular in the world of gaming – forms a contrast to the slowness, or the focus, that the medium of painting demands of the viewer. In the first room, Robert Seidel transforms and translates the virtual reality and chronological sequence of the Tetris game play into a large format painting titled »Game Over« (2015). The elements of the game appear simultaneous and mutate into abstract fields of colour, they gain a new complexity and surprising spatial effect in the painterly execution. While Seidel’s paintings often feature direct references to digital games, they have no intent to imitate them. The games function as points of departure for new playing fields in the medium of painting, the visual vocabulary of the source material leads to new levels of “content” and painterly forms. The concepts of the terms game and simulation – this is made apparent by Seidel’s pictures – are closely interconnected. In consequence, the pictures also testify to the painter’s »joy« in playing with the image surface and the exploring the possibilities of composition. On first glance, the works of Tobias Hild recall stage settings. But the high level of abstraction of the individual elements within the frame, the interplay of figure and space based on apparently simple colours and shapes counteract spatial relations and figurative characteristics familiar to us; they defy an observation from the perspective of reality. 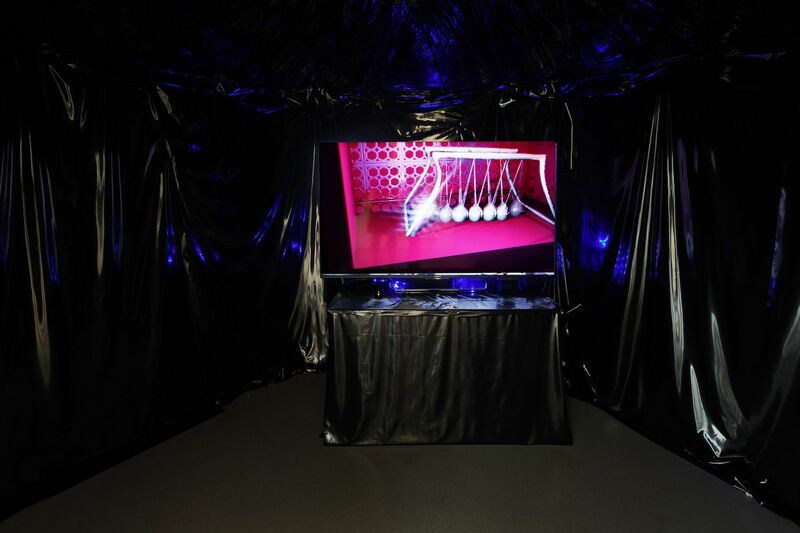 In the exploration of virtual worlds that were developed at a time when the technical parameters for the simulation of three-dimensional space on screen was still underdeveloped, Hild creates symbolic pictures of great visual presence. His seemingly naive visual language has its origins in an act of refusal to create images in analogy to empiricism. In contrast to the virtual worlds of the digital and its schematic simulacra, Hild’s compositions claim an independent reality beyond simulation. A similarly playful, at times mischievous air characterises the figures that inhabit the scenarios of Julius Hofmann. In his ongoing project »Might of Young Engines«, a four-part video work, the second part of which was completed for this exhibition and will be on show for the first time together with the previous film at G2 Kunsthalle, the artist meticulously and with great attention to detail crafts an imaginary “virtual world” based on the aesthetics of digital adventure games of the 1990s. Hofmann does not lead his game toward any definite conclusion. He moves his characters through empty spaces and boundary zones, he shows the render errors and visualises glitches that disrupt the smooth digital surface. With the use of anachronistic elements his cast of characters are left to wander a remix of painting and animated movie, somewhere on the edge of possibility. Hofmann achieves a merging of painting and computer graphics, where the processes of composition and structure of both media become inseparable in their complexity. Tobias Hild, born 1979 in Herborn/Hesse, lives and works in Leipzig. Education: 2007–2010 »Meisterschüler« (postgraduate) with Annette Schröter, Hochschule für Grafik und Buchkunst Leipzig, 2005–2007 Hochschule für Grafik und Buchkunst Leipzig (class of Sighard Gille), 2000–2004 University Duisburg-Essen, Awards: 2012 work fellowship of the Kulturstiftung des Freistaates Sachsen. Solo exhibitions (selection): 2016 Museum Junge Kunst Frankfurt/ Oder, 2012 V8 Plattform für neue Kunst Karlsruhe, 2010 Bruch & Dallas Cologne. Group shows (selection): 2016 Kunsthalle der Sparkasse Leipzig, 2015 Kunstverein Duisburg, 2013 Appels Gallery Amsterdam, 2011 Kunstverein Freiburg. Julius Hofmann, born 1983 in Göttingen, lives and works near Göttingen. Education: 2005–2011 Hochschule für Grafik und Buchkunst Leipzig (classes of Neo Rauch and Heribert C. Ottersbach. 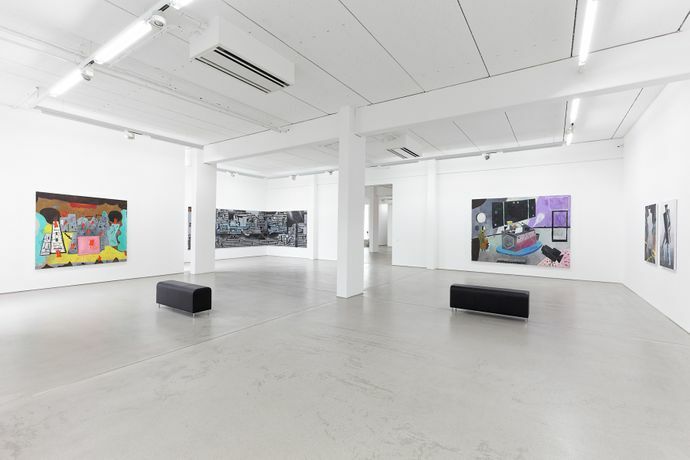 Solo exhibitions (selection): 2016 SSZ Süd Gallery Cologne, 2015 Ornis A. 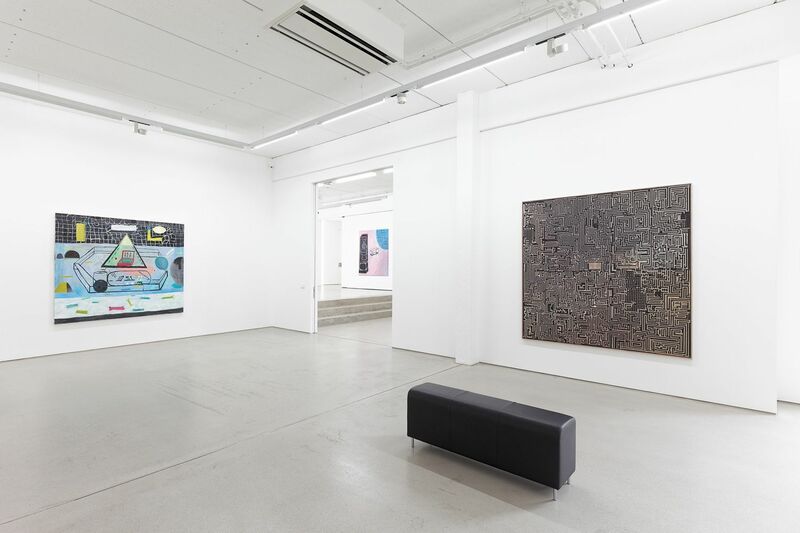 Gallery Amsterdam, 2015 Galerie Kleindienst Leipzig, 2014 Villa Katzorke Essen, 2011 UNC Gallery Seoul/South Korea. Group shows (selection): 2016 Vietnam Fine Arts Museum, Hanoi, 2016 Feinkunst Krüger Hamburg, 2016 Bayer Kulturhaus Leverkusen, 2015 Auf AEG Nuremberg, 2015 Kunsthalle der Sparkasse Leipzig, 2014 Forum Kunst Rottweil, 2013 Museum Abtei Liesborn. Robert Seidel, born 1983 in Grimma, lives and works in Leipzig. Education: 2009–2011 »Meisterschüler« (postgraduate) with Neo Rauch, Hochschule für Grafik und Buchkunst Leipzig, 2003–2008 Hochschule für Grafik und Buchkunst Leipzig (class of Neo Rauch), Awards: 2015 Marianne Defet grant, Nuremberg, 2013 De Ateliers short track artist residency (DASTR), Amsterdam, 2013 project fellowship, Kulturstiftung des Freistaates Sachsen, 2012 work fellowhip, Stiftung Kunstfonds Bonn. 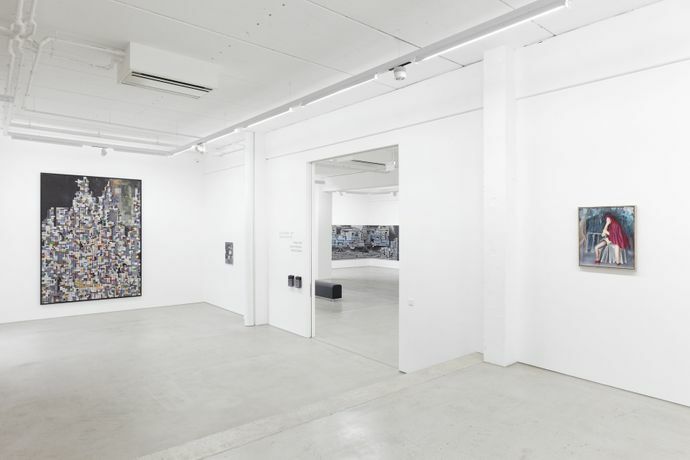 Solo exhibitions (selection): 2016 Gerhard Hofland Amsterdam, 2016 ASPN Leipzig, 2015 Institut für Moderne Kunst Nuremberg. Group shows (selection): 2016 Kunsthalle Nuremberg, 2015 G2 Kunsthalle Leipzig, 2015 Auf AEG Nuremberg, 2015 Esmoa Los Angeles, 2014 EIGEN + ART Lab Berlin, 2013 Neuer Kunstverein Aschaffenburg. Artist talk: Tuesday 27 June 2017 6.30pm Tobias Hild, Julius Hofmann and Robert Seidel in conversation with curator Anka Ziefer. Special opening hours: Sat 16 September 2017 noon–5pm & Sun 17 September 2017 noon–3pm (in collaboration with the Spinnerei Galleries on occasion of the Autumn Gallery Tour 2017). The G2 offers special group tours in various languages (German, English, French, Italian and Russian) and school programs free of charge for teachers and students. Individual visits may be scheduled upon request. Please contact us.